Dr. Karen Wicks holds a Ph.D. from New York University, has taught in middle school, high school, and college level. She was a college administrator at City University of New York and served as director for curriculum and instructional development at the College Board—the SAT people, working with teachers throughout the country in developing and implementing more learner-centered curriculum with a multidisciplinary focus. As a learning specialist and educator for more than 40 years, Dr. Wicks has specialized in educational disciplines across the curriculum and has been training learners at all ages for many years. The Royal Live Oaks Academy of the Arts & Sciences Charter School (RLOA) opened its doors on August 20, 2012. The majority of its student population came from the Jasper County School District, with a small number of students from Beaufort County and private schools. More than ninety percent of the student population qualifies for free and/or reduced lunch. One-third of the student population of 500 is Hispanic, one-third is African-American, and one-third is Caucasian. RLOA has demonstrated that students have made gains from their previous environments, even though our students still need consistent modifications and individualized instruction to make major gains. In order to increase the successful participation of low-income students and to build a college-seeking culture, RLOA is providing an engaged learning environment that prepares students for the twenty-first century global economy. In accordance with the South Carolina Charter School Act of 2005, RLOA's focus is to improve student learning, increase opportunities for students, encourage the use of a variety of productive teaching methods, establish new forms of accountability, create new professional opportunities for teachers, and lead South Carolina in reaching academic excellence. The educational program of RLOA is designed to address the individual needs of every student and serve children's diverse learning styles within a small school environment of shared core values. Our school culture fosters academic pride, positive peer support, and a sense of personal responsibility among students, parents, teachers, staff, and other community members. RLOA provides a positive learning environment in which children can grow to their full potential. The integration of the arts throughout a project-based curriculum provides students with natural avenues to utilize their strengths in the service of the areas in which they need to grow. We are currently serving Kindergarten through 12th grade. Our K-12th grade curriculum incorporates a STEAM (science, technology, engineering, art, math) focus to provide our students with the training they need to function in the modern economy. Arts integration and project-based learning fit perfectly into this program. 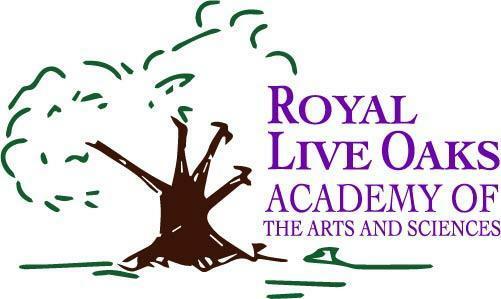 As of July 1, 2018, Royal Live Oaks Academy is authorized by the Charter Institute at Erskine. RLOA is a tuition-free, public charter school, and enrollment is open to any child in South Carolina.